Writing is a way of life for some. We are compelled to write, we don’t write just because we want to. There are some stories that must absolutely be told, either by word of mouth or by printed page. Now that we have the Internet, some stories can take on a life of their own. Keep in mind the Internet is only temporary. When the electricity stops, the stories of the Internet will quickly disappear. Books, however, are more permanent than the electrons of the Internet, which is why they will always remain so very important. A writer with a story is tormented by words – the words fly around in a writer’s head demanding to be let out, placed on a page, made into a book, created into a play, made into a movie, and recorded for history. When a writer sleeps at night, often words will wake the writer in the middle of the night. It is the smart writer who sleeps with something kept next to the bed to write down ideas in the darkness of the night. Writers can find ideas almost anywhere, all a writer need do to collect them is to keep eyes open and ears tuned. Once the idea is collected, then comes the organizing of thought, the arranging of words, and the finalizing of the manuscript. It is finalizing the manuscript where the work is really completed. In the old days, we used typewriters. Manual typewriters. Many of today’s young writers have probably never used a typewriter. For those of you who fall into this category, go find a library, school, or bookstore that may be in possession of one of these monstrosities. For the full effect, you should look for a machine that is manual, not electric. Also, find a typewriter with the longest key stroke possible. Once you try writing on the atrocity, you will suddenly understand why writing on your computer or tablet is so much easier. 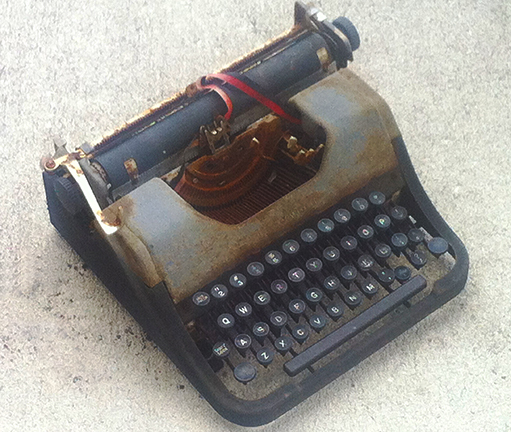 “In the old days” just to get into the University of Florida School of Journalism, one had to type at least 25 words per minute on these manual torture devices. In order for prospective journalists to graduate from the J-School, typing skills had to improve to 35 wpm. Today, I think every young millennial can bang out at least 110 wpm on a multitude of different devices. Over the course of the last 50 years, things have changed quite a bit. This makes me wonder how things are going to change in the next 50. This entry was posted in Life in General, Uncategorized, Writing and tagged books, bookstore, Florida, great ideas, library, manuscript, memories, notepad and pencil, publishers, school, stories, the Internet, typewriters, typing skills, University of Florida, University of Florida School of Journalism, words, writers, “the old days”. Bookmark the permalink. I understand the dilemma you describe, Joe. For instance, when my wife noticed me watching an attractive woman recently, I explained that I was just trying to determine how I would characterize her in a book. She allowed that it might be more of a challenge to describe a less attractive subject and I, of course, had to agree. We writers are often misunderstood and frustrated. Harrison, roger. I am also sometimes totally misunderstood. I love (and agree with) your descriptions of the ole’ manual typewriters! I do actually miss some of the electrics–the Selectric II with the ball of letters was cool and the finished product was as clear and clean as computer type. But alas, technology moves us forward.